Welcome to this week’s edition of MMAterial Facts, where we feature articles from around the MMA community. “But perhaps there’s more to the story. In fact, Diaz’s biggest supporter in the media, Middle Easy, has spent the better part of the past two days going to bat for him and proclaiming the promoters of the event were shady. There was also a weigh-in snafu with Estima, who apparently missed weight the day before but was able to make weight the day of the contest. “Phil Davis will look to rebound from his first career loss in August when he takes on Chad Griggs. “After enjoying a brief 10-day hiatus, Zuffa, LLC comes storming back with a vengeance this week. The world’s most prestigious mixed martial arts promotion will be hosting a pair of shows on two different coasts within a 96-hour span. “I’m at the last stage (of recovery). I’ll be back pretty soon,” St-Pierre said during an exclusive interview with Showdown Joe Ferraro on UFC Central. “After Team Diaz filed their response to Nevada’s complaint, Keith Kizer telegraphed (in the media) what the response would be. Rather than confront what Goodman & Tweedale are arguing regarding WADA standards & Nevada law, Keith Kizer & company are now shifting to what I call “the Al Capone” strategy. Kizer’s side is now going after Team Diaz over the way the medical questionnaire was answered regarding Nick Diaz & his medical marijuana usage. “Brock Lesnar recently retired from mixed martial arts (MMA) and he’s already reportedly signed a one-year deal with the popular pro wrestling promotion, potentially to debut at tonight’s WrestleMania 28 event. “After kicking off the opening round of their Welterweight Tournament on Friday night, Bellator CEO Bjorn Rebney announced the tourney would resume at “Bellator 67″ on May 4th. Casino Rama in Ontario, Canada will host the festivities. “He used to fight at 170 pounds and was the bane of Dan Hardy’s existence. Trouble making Welterweight, Anthony Johnson was set to make the move to Middleweight on Saturday to face Vitor Belfort. When it came time for weigh-in… he was 12 pounds over the established weight for the fight. Medical reasons or not, one thing is for certain — Anthony’s future in MMA is at Light Heavyweight or Heavyweight. Middleweight doesn’t look to be sustainable for him. He weighed in at 197 pounds for a Middleweight fight… and he was cutting to make Welterweight a year ago. How did his body survive that massive weight cut? The penalty for not making weight? 20% purse reduction. “It seems that the UFC’s upcoming event in Globe Arena in Stockholm was sold out in just one hour after the tickets went to public sale. According to some fans Ticnet’s customer service said that the event was sold out 30 minutes after the sales started. “Rumble is not on-weight, and when I say he’s off-weight, he’s way off-weight,” an irked White said. “The way this normally works is, Vitor Belfort can come in on-weight, Vitor is at-weight, and he would get 20 percent of Johnson’s purse. “Mo Lawal can admit it now: things didn’t go the way he thought they would when he first walked though the doors of the American Kickboxing Academy in San Jose, Calif. in the spring of 2011. What happened was simple, really. 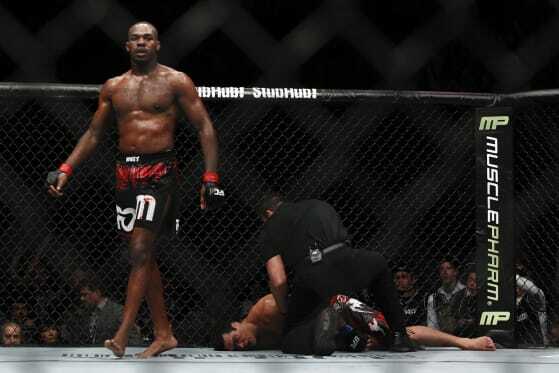 He came in with all the swagger you’d expect from a man who goes by the moniker of “King” Mo, and then he found out the hard way that he wasn’t the only MMA royalty on those mats. “MMA — like all sports — has to watch its image. The challenges in MMA are unique in the sense that we still have grumpy old sports editors and corporate sponsors who don’t want to deal with the sport. But they’re not unique in the sense that any sport can be stereotyped. Browse any sports site and read the comments about people who think the NBA is populated by “thugs.” Look at the damage control baseball has had to do in the wake of its drug scandals and labor strife. “Former UFC welterweight contender Karo Parisyan has been battling personal demons and waning motivation for the last few years, seeking to find the drive and strength of mind which once carried him near the top of the heap. “It has been a tough Twitter week for a couple of former UFC champions. BJ Penn has taken some heat for his harsh words for Nick Diaz on the blue-birded network, while Matt Hughes (Pictured left) has come under heavy fire for the controversial hunting pictures he recently posted on his account. “The California State Athletic Commission (CSAC) has suspended the license of Mixed Martial Arts (MMA) fighter Cristiane Justino Santos, better known in MMA circles as Cris Cyborg, and has fined her $2,500 as the result of a positive test for a banned substance. “In a sport with the sheer variety of outcomes that MMA has, there’s no specific formula for what makes a great fight. Instead, truly great matches are made when some or all of the elements of MMA come together in two fighters to make something that is both a highly competitive bout and a dramatic story told through action. “Yes, he can go. He can go to the [WWE],” said White, who was exiting a night club out of Hollywood, California early this week, slightly more inebriated than usual. “There are two groups of people who would like to see some very different visions for the future of fighting. One is hoping for a renaissance of Catch-as-Catch-Can… and the other has a more futuristic view of where the fight business should be heading. First, the fine group of humans who are interested in catch wrestling. As you can see up above, I highly recommend Jake Shannon’s book on Scientific Wrestling. He and many others are doing their best to emphasize the importance of Catch on the sport of MMA. Randy Couture did an interview with Eddie Goldman last Friday talking about this very issue in relation to his new book called The Last Round w/ Sara Levin (who worked for USA Wrestling). Book ordering/background information can be found on Amazon & Facebook. “The self-destructiveness, how have you been able to overcome that? “The bottom line is, I’m done with the guy,” the 34-year-old Sonnen said in an excerpt released prior to the show by TSN. “He and I have no business. . . . He’s so far over the hill and past his prime it’s not worth talking about. “I’m going to become the No. 1 contender on January 28th, but despite what you may think, I am not going to use that voucher to fight Anderson Silva. I’ll be looking at Dos Santos, Jones and possibly St-Pierre. “It’s the holiday season and after fighting off crazed moms who just have to get that last bottle of Justin Bieber shampoo, I finally finished my MMA Christmas shopping. I couldn’t find a gift for everyone but I think I did well and hopefully all the fighters and MMA personalities appreciate all the thought and money I put into their gifts. “Exactly four Fridays ago, Urijah Faber’s (Pictured) 19-year-old sister, Michaella Tastad, was involved in a horrific car accident. It was the morning after she had celebrated Thanksgiving dinner with her family. “In less than two weeks, 2008 Beijing Olympic Gold Medalist in Judo, Satoshi Ishii, will step inside the ring at the Saitama Super Arena in Saitama, Japan, for the biggest fight of his young Mixed Martial Arts career, against “The Last Emperor” Fedor Emelianenko. Ishii will be the eighth Japanese fighter to square off against Emelianenko, looking to become the first to defeat him. “Everyone loves to see the underdog win, especially because they never expect it. In MMA, unpredictability is a constant variable that truly makes it one of the most exciting sports out there. Sometimes, it’s not even the underdog, but rather the fighter that most thought had zero chance at all to win, let alone survive the fight. “This list is the top 10 gifts for the 2011 holiday season! “The organization officially announced its return to Sydney, Australia, Wednesday night. UFC Sydney, as it’s being called, will take place on Saturday, March 3, at the Allphones Arena, formerly Acer Arena, in Sydney. “Alistair Overeem participated at today’s NSAC meeting via phone. Keith Kizer stated that out-of-competition drug testing for both Brock Lesnar & Alistair Overeem was established on November 17th. Overeem’s drug test did not occur, as his camp replied back on November 21st (he left for Holland). Brock’s drug test was done at a hospital. Overeem ended up taking a blood test on November 23rd. It was not the test NSAC was looking for but the blood test came back clean. Overeem ended up taking the test the NSAC wanted on December 7th and the results haven’t come back yet. Overeem was quizzed about why he needed to go to Germany for testing instead of doing the testing in Holland. At this point, the commission put Overeem under oath during his testimony. “As he was being ferried into the area, the car he was travelling in was stopped by a roadblock and armed police swooped on the vehicle. Police had the vehicle on their database as being linked to a local man who they believe to be a key gangland figure. Sherk thought the car was being subjected to a routine stop until it turned out to involve several carloads of police officers carrying automatic weapons, including Hechler and Koch MP5 machine guns – the UK police do not normally carry guns. Having remained sat in his passenger seat because he had not understood an instruction to exit the vehicle, Sherk was dragged out by tense officers. They cuffed his hands behind his back and pulled him away where he was none too gently searched before being dumped on the floor. When a search of the car had been conducted – the officers were looking for firearms – Sherk and his driver were allowed on their way. Muñoz echoes his sentiment, saying that whatever friendship he and Sonnen have maintained since their college days will be left at the cage door. “According to Heavy.com, Brett Rogers (Pictured) has been denied a visa and won’t be allowed to enter Japan to face Tim Sylvia in Dream’s end of the year extravaganza. Because the former Strikeforce heavyweight was turned away so close to showtime, Sylvia has also been removed from the star-studded card. “Lesnar and another man, according to Sportsnet.ca, were cited for offenses related to the Alberta Fish and Wildlife Act. The offenses that the duo were charged with were the alleged improper affixation of tags, spoilage of skin and edible flesh, and possession of a controlled animal. “As a superstar production unit, the show has had mixed results. It began with a splash in 2005, launching the careers of Forrest Griffin, Kenny Florian, Josh Koscheck and others, but in time, competition for talent from other organizations made it more difficult to land prime talent. That’s led to criticism from some who believe it no longer serves a real purpose as a feeder. “MMAFighting’s E. Casey Leydon spent some time with Mayhem as he gears up to face Bisping this weekend, producing a Fight Journal video to get an inside look at Mayhem’s life leading up to the fight. “Would you have cut Chris Leben after his latest run-in with drug/alcohol abuse? “Bisping is one of the UFC’s most marketable fighters thanks to his international appeal. He is also one of the company’s most hated fighters because of his antics both in and out of the Octagon. Many fighters in MMA talk trash. But Bisping has gone beyond that, being disrespectful to fans and fighters alike. It’s easy for Bisping to talk trash. But if he really wants to shut up his doubters, he will have to get wins over big-name opponents. “The first kid begins to cry less than an hour into practice. Everyone can see it coming. That trembling lower lip, that frustrated stomp of the feet. When the tears finally start, twisting his face into a little ball of anguish, no one seems particularly surprised. “So it looks like Rampage Jackson is going to fight in Japan after all. “There is no one to be ashamed about on that list. He also holds victories over Misaki and Wanderlei Silva. That means of his eight losses, there are only five fighters he hasn’t redeemed himself against. “When it was initially announced that Cain Velasquez would make the first defense of his heavyweight belt against Junior dos Santos, the early betting lines favored dos Santos to win, as the memory of his thrashing of Shane Carwin was still fresh in everyone’s mind. With time though, public opinion in general shifted in Velasquez’s favor, with the majority of pundits, fans and fighters alike picking Velasquez to beat dos Santos. Pat Smith kills a ninja, but is scared of Royce Gracie being on top.